Nora Kramer Photography: Breaking The 8" x 10" Mindset: What Size Portraits Should I Order For My Living Room Walls? 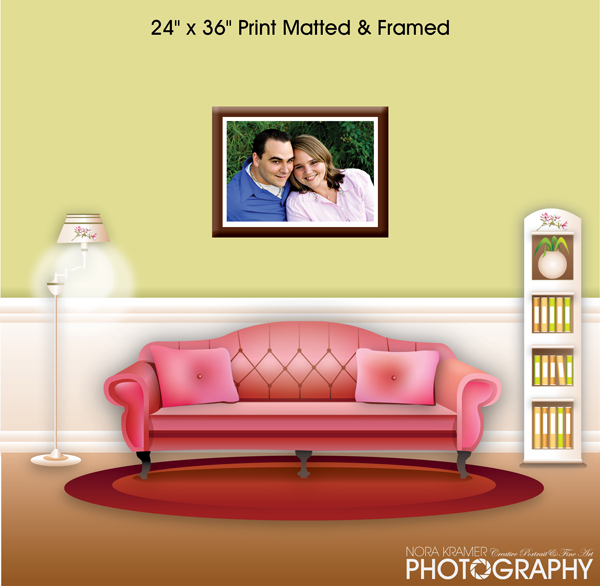 Many people are unsure as to what size portraits they should order from their photography session for their wall art. Most clients automatically think of an 8" x 10" as being a standard portrait size. They place their order and say something along the lines of: "I want a big one for the wall. How much is an 8" x 10"?" Now, let's stop and think for a minute. Is an 8" x 10" really an adequate choice for the space it will be displayed in? Let's say you want to make the portrait the focal centerpiece of your living room, by hanging it above your couch or fireplace mantel. How well does an 8" x 10" work in this space? Wow, that "big" 8" x 10" sure seems tiny sitting above to the sofa, now doesn't it? Even if the image is great and you just love it, it certainly loses it's "wow factor" sitting on the wall at that size. Now let's compare it to a 24" x 36" piece of wall art. Oh my! All of the sudden an 8" x 10" doesn't seem much like a wall portrait, does it? However, more often than not, this is the size most people seem to want to begin with, until they see how "big" it really is on their wall. So what makes the 8" x 10" the "wall portrait" size of choice with most people? My best guess is people draw that 8" x 10" size from "packages" that they may have been presented in the past from budget photographers, such as JC Penny's and Sears, or from the packages put together by the school photographers when their kids pictures are taken every year. While these budget packages may come with great prices and convenient ordering, "wall art" they are not. Sure, they can be added to art that is already on the walls, but as a "focal piece" they just don't work at that size. Now let's have a look at some of the most popular sizes of wall portraits, and see how they stack up against each other on the same wall. As you can see, size does matter when choosing your living room wall art. So, how do you go about choosing the right size for your walls? Well, one way is to have me visit your home so we can go over your options for the right size prints, canvases or galleries to put in the spaces you want to decorate. If you prefer to do it yourself, there are several things you need to keep in mind before you place your print order. Think about the size room you will be putting your artwork in. Consider where the portrait will hang. Is the ceiling height 8 feet or 15 feet? How large is the empty space on the wall? Step back and view the space where you will be hanging your picture from about 20 feet away. 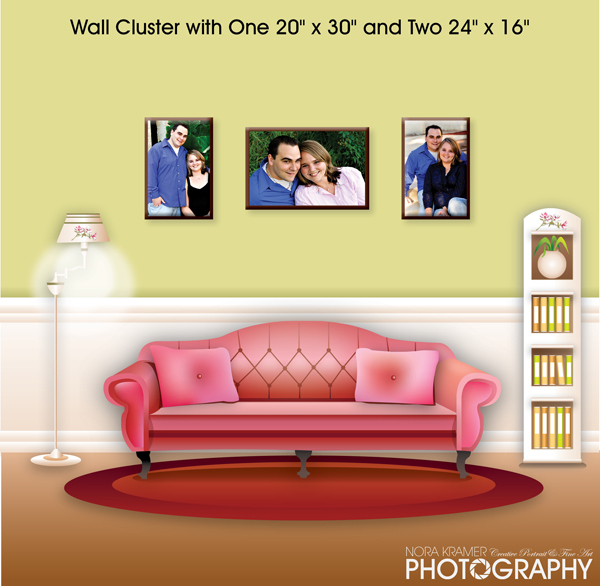 Determine if you want to hang one large portrait by itself or a slightly smaller portrait with a cluster of other sizes around it. Consider the frame in your sizing as well. 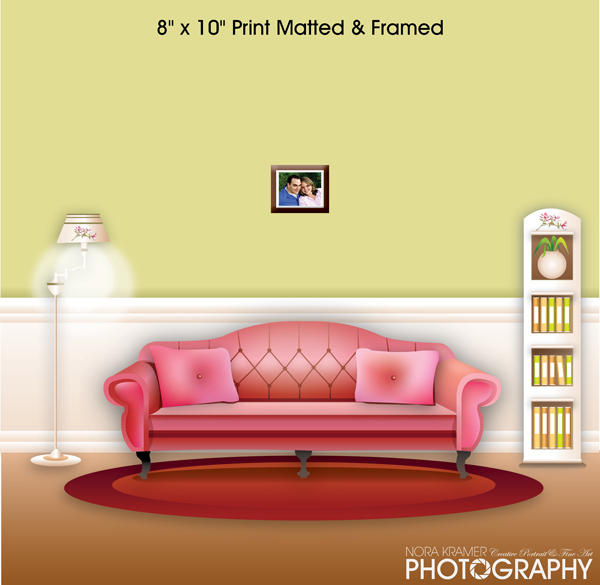 Will you be doing a framed print or would you prefer a free floating canvas gallery wrap portrait? A frame will give some additional width and height to your print, when it is finished. If you are considering a ready to hang fine art canvas print that will not be framed, you may want to go with a slightly larger size. Clusters, like shown above, usually are comprised of individual images. 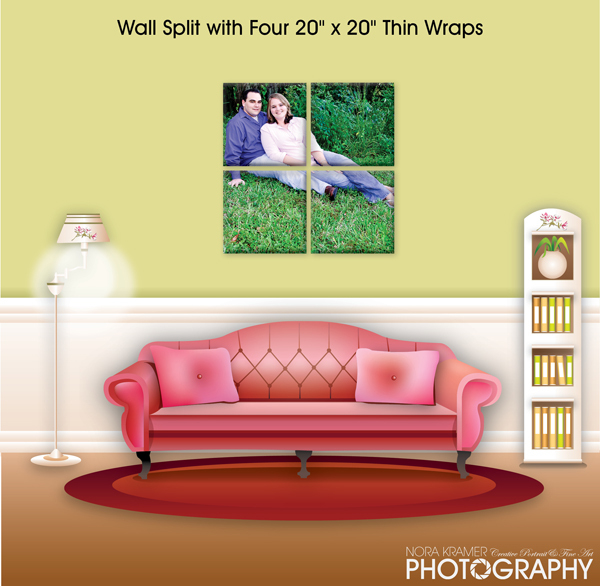 Perhaps you want to go bold and do a wall split, which is a single image mosaic across multiple prints, designed to be hung 1" apart. Okay, now we are starting to see real "wall art," right? The options are limitless once you get out of the 8" x 10" mindset! If you have chosen me to shoot your photographs it means you have moved beyond JC Penny/Sears budget thinking, when it comes to professional portraiture, so why stay in the same mindset when it comes to the final finished product? Keep in mind, because I have a professional photo lab behind me, I can do prints in just about any size you can imagine. But, on top of standard prints that are traditionally matted and framed by either you, my lab, or at a frame shop, I can also produce items such as MetalPrints, CollageWall Displays, Canvas Gallery Wraps, Thin Wraps, and Canvas and Watercolor Giclées, offering an even wider variety of options for your wall art. Nora - this is an excellent, informative article. Do I have your permission to link to your article on my blog? It illustrates perfectly what I'm trying to convey in terms of wall art, and the visuals are a fabulous bonus. Thank you.